Today we have a guest joining us for our Soccer Mom series! I'm so excited to welcome Laurel from Ducks in a Row. Laurel is amazing! She is my go to gal for great tips on organizing, exercising, and healthy eating. Her famous green smoothie recipe has become a favorite here, and I especially like her Fit Friday posts which inspire me each week. Thank You Sarah! I have had so much fun following along! Just like Sarah, I also have four kids. Although my baby isn't involved in anything yet, the other three more than make up for it! As I thought about what really helps us during the crazy time, I immediately went to Meal Prep! Well fed kids = happy kids and there is no way we could get through games and practices by feeding children on the fly. I have to prepare. This includes making weekly meal plans, prepping snacks ahead of time, packing bags and keeping them in the freezer. I use my rice cooker, my crock pot, and freezer meals weekly. Life savers, I tell you! I'd love to share one of our favorite meals! I do most of the prep during the day, when my one year old is napping. Then, I can get dinner ready in less than 10 minutes when we are actually sitting down to eat. 10 MINUTES - that is faster than it takes to get my kids to set the table. 2 cups of cooked rice - I use a brown rice/quinoa mixture that I pre-cook in my rice cooker. 1.Heat oil over medium heat. Add onion, garlic, green chilies, and cumin. Cook until onions are soft, stirring occasionally. Add tomato paste and cook for one more minute - stirring continually. 2. Add one can of beans and mash gently in the pan - I use a fork and mash the heck out of it. Add the second can of beans and the water and stir to combine. After the mixture comes to a boil, turn the heat to medium and let it simmer for about 10 minutes - it will start to thicken up. Stir it every now and then so it doesn't burn. Add the corn and cook for 2 more minutes. Add the garlic powder. Turn off the heat and add the cooked rice. 4. Fill up the burritos and wrap. I have a son with a dairy allergy, so we leave out the cheese from the middle and sprinkle it on top. I also have a daughter with a wheat allergy, so hers is put in a corn tortilla. These are done and can be quickly heated up when it is time to eat. We serve it with salsa, avocado, and my oldest daughter likes sour cream. Additionally, these may be frozen - I wrap them in tin foil individually and then put them in freezer bags. Just pull them out of the freezer and heat! I love having a stash of these in the freezer. My husband also takes them to work. 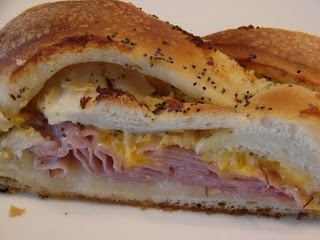 We also love Ham and Cheese Braid (you can put really anything inside the middle). This can be made ahead of time and is quite portable. Good luck to all of you soccer moms out there! Please stop by Ducks in a Row and say HI! Thank you Laurel! I cant wait to try this recipe. I'm always looking for a new meal to add to my standby list. Looking for more Tips tutorials?